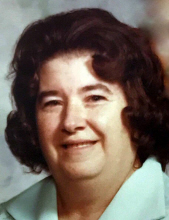 Gladys Leona Butler, 95, of Paris, IL, formerly of Hume, died at 8:15 p.m. on Saturday, October 13, 2018, at home with her family. Services will be held on Thursday, October 18, at 1:00 p.m. at Krabel Funeral Home in Chrisman, IL. Visitation will be held two hours prior to the service, beginning at 11:00 a.m. Burial will follow at Young America Cemetery in Hume. Gladys was born October 8, 1923 in Salem, IL, the daughter of Frank and Mary Frances Hicks. She married William Henry Butler on July 15, 1946 in Salem. Surviving are two sons: Wayne (Vickie) Butler of Georgetown, IL, and Arthur Friend Jr.; three daughters: Frances Bristow of West Terre Haute, IN, Patricia Jenkins of Florida, and Anita (David) Butler of Paris, IL. She also leaves behind 14 grandchildren, 3 step-grandchildren, 23 great-grandchildren, 12 great-great-grandchildren, 9 step-great-grandchildren, and 8 step-great-great-grandchildren. She was preceded in death by her husband, William, 3 daughters: Helen, Karen, and Edna, one son: Ronnie, one brother and one sister, 5 half-sisters and 2 half-brothers, a grandson: Scott, and a great-grandson: Bryant. Gladys was retired after working as a Kitchen Help at Paris Healthcare. She was a loving mother and a proud grandma. Memorial contributions may be made to Lincolnland Home and Hospice Care. To send flowers or a remembrance gift to the family of Gladys L. Butler, please visit our Tribute Store. "Email Address" would like to share the life celebration of Gladys L. Butler. Click on the "link" to go to share a favorite memory or leave a condolence message for the family.